The laws of the United States of America were created by the Founding Fathers to protect, serve and help our citizens. However, many of us do not receive the guidance we need because of the confusing nature and expense of legal services offered in our country. 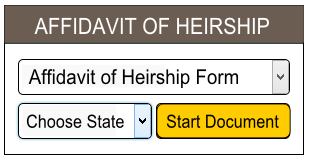 At Heirship.com, we help you find free and affordable legal forms that can be completed on your own time. We spend our energy and focus on making it simple for you to get the right legal forms you need, so you don’t waste time and money on expensive legal forms that you can otherwise complete yourself. We offer free legal forms and free legal information, not advice, to help you find out if you can save money by doing it yourself. Heirship.com does not provide legal advice, nor do we offer legal representation. We are not a law firm or a substitute for an attorney. We offer free legal information and legal forms for specific legal solutions only and cannot advise you of any course of action to take. If you have a serious legal issue, we strongly suggest you consult an attorney.